Undoubtedly one of the most remarkable sights of Hyderabad is the Falaknuma Palace, the Sky -Touching, perched on a small hill 3 km south of Char Minar. 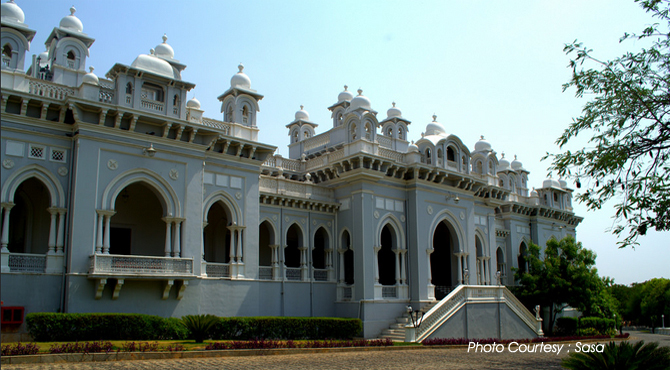 The palace is one of the testimony to the glory of the Nizams (the rulers of Hyderabad). The smallest of the Nizam's four palaces, this served as a royal guesthouse for the Nizams. The palace was built by Nawab Vikarul Umra Bahadur, the fifth Emir from the noble Paigah family, who later became Prime Minister of Hyderabad (1894-1901). The palace was later purchased by the Nizam Mahboob Ali Khan in 1897 and later added other structures like the Coronation building. The sixth Nizam occasionally lived here and passed away in this building in 1911. The palace was designed by an Italian architect and follows a western architectural style ranging from 18th century England to Louis the XIV's of France. The palace also has a rare blend of Italian and Tudor architecture. Covers an area of 9,39,712 square meters, its foundation was laid on the 3rd of March, 1884, and it took 9 years to complete the construction of the Palace. Marble from Italy were used to create its opulent interiors. The Palace has a shape of a scorpion with two stings spread out as wings on the north. The central area of the palace is occupied by the main building can be accessed through two levels of basement. The main gate presents a pyramidal composition of Neo-Classical storeys framing a broad arch. The road from here ascends to the main block, where a grand Palladian vista greets the visitor. The interiors of this building has an Italian marble staircase supporting marble figures and lined with portraits of British Governor Generals. The state reception room is in Louis XIV style decorated with frescoes and gilded relief's. The room has a library with a walnut carved roof containing the most valuable collection of manuscripts and printed books. It has also one of the finest collections of the holy Quran in India. A smoking room, billiard room and card room, connected by arched openings with curtains, lead to the massive dining hall, where a long oval table is surrounded by 101 seats. The rosewood chairs with green leather upholstery and tableware made of gold and crystal make this palace an awe-inspiring experience. Apart these, the palace boasts such many 222 lavishly decorated rooms and 22 spacious halls. The palace has lavishly furnished with some of the finest treasures collected by the Nizam. It has a superb interior with marble, chandeliers, English furniture, statues and a large collection of paintings. The walls and the ceiling are artistically painted and decorated. Falaknuma also has collection of jade objects, which is considered unique in the world. The highlights of the palace is large beautiful Venetian chandeliers including a 138-arm Osler chandelier (said that it took six months to clean this) and the palace has 40 such chandeliers adorning the hall. Its glass-stained windows throw a spectrum of colours into the rooms. Another interesting features of this palace is that it has one of the largest electrical switchboards in India and the world's largest manually operated organ. Since it is the private property of Nawab Mukarramjah Bahadur, the grandson of Nizam VII., one needs to get special permission to see it. Today, the palace is a legal dispute between the Taj group, who wish to turn the palaces into a hotel, and Nawab Mukarramjah Bahadur who claims never to have sold the palace to anyone.